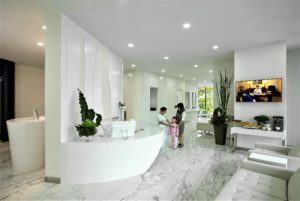 Imagine avoiding the queue, taking a private lift to a marble-floored lobby that serves buffet snacks and being introduced to a premium suite: no, you are not entering a VIP lounge in a bank, but a modern outpatient clinic in the Philippines. Centre Médicale Internationale (CMI), an outpatient-based, multi-speciality and urgent-care clinic, targeting C-level business executives, is marketed as a facility with “hotel settings and concierge services”. 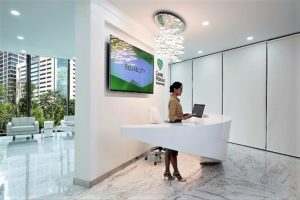 It is said to offer innovative and premium features on top of urgent medical care, including desks for patients to pursue their work-related tasks. The idea is – from the clients’ perspective – to make their experience “less threatening than medical consultation usually is,” CMI director Dr Hazel Zuellig said in an interview with Innovation Hong Kong. Behind the medical centre’s luxury façade is an ambitious aim to address some of the lingering problems in the Philippine healthcare system, through pioneering measures. Public healthcare in the Philippines is – in a similar manner to Hong Kong – characterised by long lines of waiting patients, in understaffed and congested hospitals and clinics. The bed occupancy rate in the public sector stood at 90 percent in 2017, according to data from the country’s Department of Health. Now, a new wave of clinical technologies, including centralised operating system and medical equipment communication system, are set to help address these issues. CMI is among the earliest adopters in the Philippines of such innovation. Most of its daily operations and its medical equipment are supported by digital technology that facilitates easy storage and archiving of information. This helps to make the process of patient care more efficient and improves a patient’s experience of the consultation phase, says is management. Across the healthcare spectrum, technological innovation is being used to transform the practice of medicine for the better. In an effort to ensure efficient workflow and improve outcomes, CMI is equipped with what the management describes as an integrated operating system. Its functions include: management of patient appointments; the assignment of its 23 consultation suites; control of electronic medical records; coordination of diagnostic examination results; management of prescriptions; oversight of pharmacy dispensing; control of billing, and management of inventory, Dr Zuellig noted. In terms of medical care, clinical procedures usually performed by physicians have at CMI generally been replaced with a laboratory information system – also referred to as an LIS. This is an integrated system for managing diagnostic equipment and is designed to minimise the risk of errors in the labelling of specimens and in the reporting of test results. The use of LIS helps CMI in providing faster and quality medical care to its patients by efficiently collecting, storing, and communicating medical information to healthcare providers. “Every specimen collected is properly assigned a barcode and all the equipment in the lab communicates using the same language,” explained Dr Zuellig. That enabled the system “to integrate all results and print reports with minimal errors,” she added. “The smaller the amount of human handling of the specimen, the fewer the errors,” Dr Zuellig noted. An example of the system’s capabilities was how a blood test is handled. Once a patient’s data is fed into the LIS system, it is barcoded and marked on all specimen collected, she explained. Diagnostic tests can then be run simultaneously and all results are collected and integrated by the LIS system. “This allows for greater accuracy, as there are no mix-ups, no mislabelling and no losing specimens,” Dr Zuellig stated, adding that so-called digital intelligence also enabled faster turnaround times for test results. Use of LIS is said to be growing quickly in the healthcare sector. According to market research and consulting organisation Market Research Engine, the market for LIS technology is expected to surpass more than US$2.50 billion in annual value by 2024. With a surging volume of health-related data and its dispersal across connected digital systems, innovation is also being applied for medical purposes. A picture archiving and communication system – Siemens PACS – is designed to integrate management of X-ray and ultrasound images. It offers multi-modality reading and makes use of artificial intelligence features to speed up a daily routine. The system is said to allow easier and faster review of images by radiologists, and also to enable comparison of images of the same subject – obtained from a variety of forms of radiological scanning – in order to improve diagnostic accuracy. In China, digitally-delivered healthcare is gaining popularity nationwide. It can range from medical consultation via video link, to distribution of prescribed medicine. In some parts of the country, people are even seeking online medical consultations at roadside kiosks. Dr Zuellig said digital technology “could be a solution” to some of the challenges facing the healthcare sector but acknowledged it was not a comprehensive fix. “There’s still value to face-to-face conversation and actual examination of a patient,” she noted. “Patients can only get quality medical consultation – including thorough examination and history taking – when it’s done face to face at least for the first consultation,” Dr Zuellig told Innovation Hong Kong. In-person attendance of clinics by patients also helped foster a relationship with the relevant physician. By encouraging face-to-face interactions with doctors, CMI also aimed to promote the concept that a family should have an assigned medicine practitioner, who could follow the health history of the family members. “In Philippine private medical centres, patients tend to seek specialist consultants right away. There are not a lot of primary care clinics. Unfortunately, sometimes, patients end up going to the wrong specialist. And there is no continuity of care,” explained Dr Zuellig. 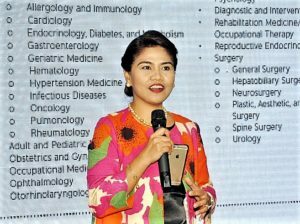 “We want to strengthen the primary care practice, where we provide personal physicians and family practitioners who can respond to urgent medical concerns, do annual physical examinations, and give advice on lifestyle and nutrition,” she noted. That meant “each patient having one regular doctor taking care of his or her overall health,” she added. This traditional person-to-person approach does have echoes on the digital side of the healthcare sector. The leveraging of social media in order to improve the patient experience is one of the latest innovations helping to transform the healthcare industry. Apart from having a digital marketing team to handle online inquiries, CMI also hosts a live Facebook discussion on a weekly basis, where its in-house medical experts share insights on a selection of healthcare topics. “The live discussions provide professional resources and proper medical information to online users, since there’s a lot of medical information on the Internet that is not necessarily evidence-based or medically-sound,” said Dr Zuellig. As a result of its ambition to move – where possible – medical care from inpatient to outpatient settings, the clinic is looking to do the same with day surgery and non-invasive speciality procedures. “If we take care of patients very well in the outpatient setting and focus on preventive strategies, then many of the critical illness can be avoided and maybe they don’t ever need to be admitted to a hospital,” Dr Zuellig stated.